Welcome to Pegasus Ventures home of more than 100 different restaurant guest checks, napkin bands, food rotation labels and cash register rolls. Pegasus Ventures distributes the entire selection of nearly 100 different restaurant guest checks,waiter pads, restaurant delivery forms, and sales books printed America's best known guest check printers, National Checking Company. A small business, Pegasus Ventures Michigan sells our own line of restaurant guest checks while also distributing America's best known restaurant guest checks from National Checking Company. All tolled Pegasus Ventures customers find more than 100 options when looking for a stock restaurant guest check for their food service operation. Every single stock restaurant guest check Pegasus Ventures offers for sale ships the same business day when ordered by noon Eastern or the next business day when guest ordered after noon Eastern time. Pegasus Ventures sells guest checks, restaurant napkin bands, waiter pads, delivery forms, cash register rolls, food safety products, far and wide throughout North America, the Caribbean, Mexico and even Europe from time to time. Providing the best customer service for more than a decade our small business proudly continues to serve small businesses far and wide with great products shipping fast! Big Selection means find a guest check to fit your food service business. 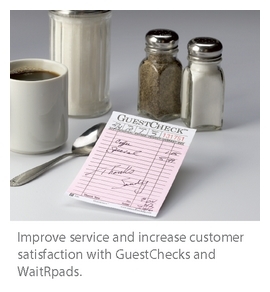 National Checking Company and Pegasus Ventures carry a huge selection of guest checks, delivery forms and waiter pads. Pegasus Ventures Michigan offers dozens of guest checks with one sure to fit your restaurant's needs. From the biggest food service operation to the smaller upscale restaurants to the best neighborhood pizza shop Pegasus Ventures brings more than 100 options to choose from. Need something customized? No problem, Pegasus Ventures also prints custom restaurant guest checks, swipe or tap now to learn more! Speed one tedious task in your restaurant when you buy restaurant napkin bands to wrap silverware from Pegasus Ventures. Professional handling without touching the flatware demonstrates just one extra step in cleanliness to your customers when waitstaff are able to add or remove flatware wrapped in napkin bands while saving your team time. Pegasus Ventures prints napkin bands for restaurants in two convenient sizes, one to wrap flatware with paper napkins, the other to wrap silverware with cloth or linen napkins. Need more? Take that extra step with napkin bands that wrap your silver or flatware with custom printed napkin bands with your restaurant's logo, name, address and website. Pegasus Ventures offers food rotation labels, large portion control bags and food rotation label dispensers along with small portion control bags from DateIt brand. Your food service operation gets the the best options for food safety, organization and while reducing waste in commercial kitchens, restaurants, and institutional food preparers.